A few days ago, as I was riding to work on the C-17 motorway, I changed lanes to overtake a car and suddenly saw a block of wood that must have fallen from a truck. I could not avoid it, and the front wheel hit it at about 100km/h. The block was rather big, and I felt the motorbike lift off the tarmac and the block graze the back wheel. I was airborne for an instant only, but I had time to be perfectly aware of the situation and think that if the bike went into a tank slapper when it landed, things could end up really, really bad for me, so I held tight onto the handlebars and prepared for the worst. The impact had been only on the right side, and even though the rim had visibly bent, it still held the air, unlike the time this happened in Kazakhstan. I called my insurance to see if that was covered, but didn’t held much hope, as this was my commuter bike and had a rather simple policy. 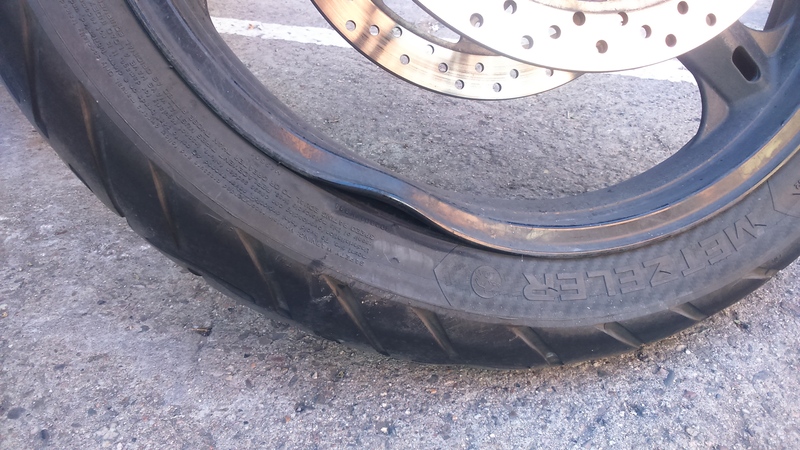 This entry was posted in Preparation and tagged bent rim, Suzuki V-Strom by Kilian. Bookmark the permalink.